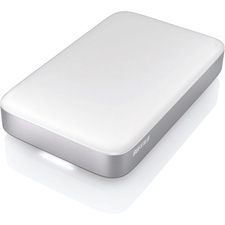 USB 3.0 portable hard drive is pocket-sized for ultimate portability. Scuff-resistant casing reduces fingerprints and scratches. Shock-resistant technology protects valuable data on the go. Easily copy and protect valuable memories and work, including music, videos and photos. Hard drive is USB powered, including the superspeed USB 3.0 for transfer speed that is 10 times faster than USB 2.0.